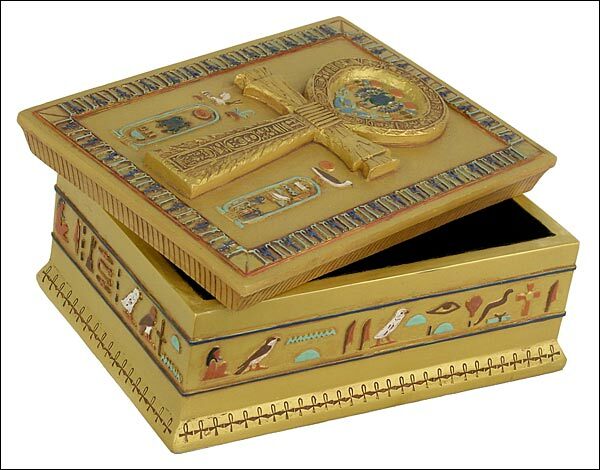 Ankh box, Ankh, Egyptian boxes. Only Kings, Queens and Gods were allowed to carry this symbol. The ankh is the Egyptian sign of life and indicates that the King or God holding it has the power to give life or take it away from lesser mortals. The Ankh as a symbol of the life giving elements of air and water was often used by a God or Goddess who holds the ankh before the King�s nose, giving him the �breath of life� or as streams of water in the form of ankhs running over the King during ritual purification. The ancient original of this reproduction was a case cover for a mirror and it was part of the funerary treasures found in the tomb of King Tutankhamun.